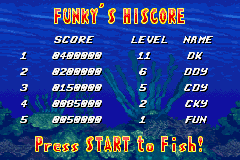 Funky's Fishing, also known as Funky Fishing in the Game Boy Color version, is a mini-game hosted by Funky Kong in both the Game Boy Color and Game Boy Advance remakes of Donkey Kong Country. In the Game Boy Color release, Funky Fishing is an extra mini-game accessible from the "Bonus" menu of the selection screen. Despite its title, Funky is never seen or associated with Funky Fishing. In this minigame, Donkey Kong sits on Enguarde and fishes off the coast of Donkey Kong Island. DK's objective is to reel out Bitesizes and Croctopuses and then throw them into a wooden rowboat with his fishing rod to gain points. DK advances to the next level when he surpasses a certain amount of points. Each level becomes progressively more difficult. Funky's Fishing also features a timer. The minigame ends when it runs out. DK replenishes it by reeling in two or more Croctopus or two or more identically colored Bitesizes (either red, blue, green, yellow or its traditional color). He can also reel every one of them in at once. DK replenishes very little of the timer from reeling in individual Croctopus or Bitesizes. The more underwater foes he simultaneously reels in, the more of the timer he regains. The minigame also features a "KOMBO" meter; one of the letters highlights red if DK reels in enough identical Croctopus and Bitesizes. The letters highlight in order. More than one letter highlights if DK captures numerous underwater foes at a time. When every letter of "KOMBO" is highlighted, DK replenishes a lot of the timer, sometimes all of it, and obtains numerous points. Black and green bottles start to drift underwater by the third level. If DK fishes in these bottles, the minigame timer depletes. More bottles fill the ocean as the level difficulty increases. Funky's Fishing is also playable in Multiplayer, where it is essentially no different. Here both players compete to reach the highest score. Unlike Crosshair Cranky, both players play as DK, meaning that the second player does not play as a blue-capped Diddy. The mini-game being played from the "Extras" menu. Funky's Fishing reappeared in the Game Boy Advance remake. It appears in the Adventure mode and the "Extras" menu, where two mini-games are playable from, the other being Candy's Dance Studio. In the Adventure mode, the mini-game is hosted at Funky's Flights, which itself was renamed to "Funky's Fishing" from the world map. Funky has a unique challenge in each of the six worlds. Donkey Kong and Diddy have the option to jump into the Fishing Barrel to play the challenge or fly to another world with the Jumbo Barrel. Each challenge has its own scenery based on the world it is in. Unlike the Game Boy Color version, either Kong can ride on Enguarde, based on whoever is the lead Kong, while the other Kong sits in the fishing boat. The lead monkey uses the fishing rod to catch things underwater, depending on what Funky requests. Using the D-Pad, the player can lower and higher the hook, wait for enemy(ies) to pass by, and reel it/them into the boat. There is a time bar which slowly decreases over time. By hauling in more than two fish at a time, a "combo" bonus is added along with extra time and bonus points, depending on how big the combo was. Hauling in something that Funky did not request lowers the time bar. Funky gives a Photograph to the Kong for every challenge they complete. The six Photographs collectively take up a Scrapbook page with a large image of DK and Diddy fishing off Donkey Kong Island's coast. Funky also gives them a Photograph of himself if they successfully reel in a crab that sometimes dashes across the ocean floor. When Funky's Fishing is selected from the Extras mode, the game randomly selects one of the six background scenery based on the Adventure mode's challenges. The gameplay is similar to the Game Boy Color version's, as the Kongs' goal is to reel in as many underwater enemies before the timer runs out. Other aquatic foes such as Chomps, Chomps Jr. and Squidges are also featured aside Croctopuses and Bitesizes. The controlled Kong can replenish the timer by either capturing two or more identically colored Bitesizes or two or more of the same underwater enemy. The game's level increases when a certain number of points are reached. The underwater creatures are not worth as much. Funky's Fishing is also playable from Multiplayer, where two players compete for the highest score. Kongo Jungle TWENTY RED FISH Right on, man. My first challenge is to catch 20 or more of those red fish within the time limit. The more you catch, the better the prize. One thing, though. Don't hook anything but the red ones. Monkey Mines CROCTOPUS CULL This time I would like you to catch 15 Croctopus within the time limit. Be careful not to hook any bottles, as these will reduce your time left. Not good, man! Vine Valley CHUMP CHOMPS Dude, these waters are full of sharks. Help me clear them out and I'll give you more excellent things. Try to hook ten within the time limit. One thing, though. Don't hook anything but sharks. Gorilla Glacier SQUIDGEN TIME Right, mate, this time you must catch as many Squidges as you can within the time limit. I reckon 50 should be no problem. Get going. Kremkroc Industries Inc. OUT WITH THE TRASH Bummer, the water is all full of trash. Collect as much as possible within the time limit. The more trash collected, the better my reward. Haul in at least 10 pieces of trash and remember, don't hook any fish! Chimp Caverns LET'S GO A KOMBO' IN Right, dude, this is a tricky one. The timer will start very low. You must try to catch more than one same-colored fish at a time; the more on the hook, the greater the kombo. Once you get a kombo, you will gain more time. Fill the timer to complete the challenge. If the player gets enough points, they can enter their initials on the hi-score dashboard, which displays the top five results. The scoreboard can also be viewed from the selection menu's "HI-SCORE" option, under "BONUS". Before the player sets a high score, the dashboard shows the top five score, all of which appear from each five Kongs (judging from their initials). Funky appears to have the highest score, while Cranky has the lowest. Default high scores are also in the "Extras" mode in Game Boy Advance remake. The scoreboard and points are entirely different, and it now displays which level each Kong stopped at. Like last time, the scoreboard only displays the top five results, and the player can enter their initials on the scoreboard if they manage to at least top the fifth highest score. Their high score placement is based on how many points they get. All of the high scores are significantly smaller, as catching fish does not warrant as many points in the Game Boy Advance remake. Most of the Kongs' initials were redone, except Funky's and Diddy's. Candy's was changed to "CDY", Donkey Kong's initials no longer have a period in the middle, and lastly Cranky's initials were changed to "CKY". Gameplay from the Game Boy Color version. The default high scores in the Game Boy Color version. The default high scores in the Game Boy Advance version.